This years 70mm festival in the Kino MIR 70 of Krnov attracted more visitors compared to previous years. It started on Friday with “Days of Heaven” a film by Terrence Malick, starring Richard Gere, Brooke Adams, Sam Shepard and Linda Manz. The 70mm Blow up in 1:1,85 format only was a very pink/violet print with 6-Track Dolby Stereo A. 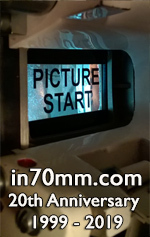 Due to vinegar syndrome on some reels, the focus had to be re-adjusted by the projectionists many times. The dialog track was very low compared to the sound effects, with too much bass information. The original premiere of the film in the Czech Republic had been on 1st July 1981. The break between the shows could be used to have some snacks in the big foyer with soft drinks or beer for reasonable prices. There were also projectors from Super 8 to 70mm on display from the collection of Pavel Tomesek. The second film on Friday afternoon was “Vzlet” a Russian film from 1979 in original language with Czech subtitles. This production was filmed in Sovscope and blown up to 70mm with 6-track magnetic sound. The picture quality was very good, in some scenes a little bit dark and all the colors remaining since it was printed on ORWO material. The dialog was directional. About the story I can not talk too much, since I did not understand the plot, except it was a story about Konstantin Tsiolkovsky and his theories about astronomy in the year 1903. The evening show was the premiere in the Czech Republic of “The Sound Of Music” in Todd AO 70 with DTS Sound. Before the showing of the film the mayor of the city was thanking the team of the Kino Mir 70 for their work. The print of the Robert Wise adaption of the Trapp Family seemed not to have the same resolution as the original from 1965. At least it had full color. The surround channel seemed to be missing. There were different DTS discs delivered, maybe the wrong one was played. The film was shown with intermission and the people enjoyed the show with applauding at the end. A get-together with cold buffet and drinks were offered after the show for the festival guests with weekend pass. Saturday morning at 10.00 a French dubbed print of “55 Days at Peking” in pink color was shown. Pavel used a filter and instead of pink, the print looked pink/violet, which I did not like. The dialogue in the film was monaural only. Mechanically the print was in good shape and nothing missing. It had an overture, intermission, entr'acte music and the exit music with the song “So little Time” sung by Andy Williams in French. Another action movie was next, “Raiders of the Lost Ark” from Steven Spielberg in an Blow Up from anamorphic 35mm Panavision with 6-track-Dolby A magnetic sound. The picture quality had only little fading and was good, except the scenes filmed in Tunis, which had no contrast. But this had nothing to do with the blow up, it had the effect in the 35mm prints from 1981 too. The sound was very directional in the music and sound effectss. All films shown at the festival were subtitled with a small projector from the 3rd row in the theater. As a surprise for the festival guests I brought in one real of “This is Cinerama” in 70mm with 6-Track Magnetic Sound. This print was made in 1971 and was the beginning of part two of the film with the sound demonstration an Cyprus Garden sequence. The 3rd Film on Saturday was “Play Time” from Jaques Tati filmed on 65mm material in 1:1,85 format and now being shown in Krnov for the first time. This new print from France had DTS 6-track-sound and good picture quality. All films were introduced in Czech language only. Before the next show, Francois Carrin brought in a reel of 35mm b/w film, made at the time of the introduction of the first official flight of PAN AM to Praha. This was more or less a commercial for the tourist offices worldwide. There was a full house on the evening show with “Dune” from David Lynch in a very good blow-up print from Todd AO 35 with 6-track Dolby A Magnetic sound. People of Krnov love this kind of movie. Same with the very late film on Saturday's program “Alien 3” in a perfect print blown up from 35mm Panavison with 6-track Dolby A magnetic sound. Before the show a reel of “Cleopatra” in pink was shown: The entry of Cleopatra into Rome with Elizabeth Taylor in Todd AO 6-track magnetic sound. Sunday morning started with the MCS 70 Superpanorama production of “Old Shatterhand” with 6-track-magnetic stereo sound. The music mix was very directional as was the French dialouge. The picture quality, besides the pink color, was very good. This film was shown in the Czech Republic in many 70mm theatres during the first run of the mid 60s. So most of the visitors were seeing the film for the second time, and they liked it. “Riders of the Lost Ark”, “The Sound of Music” and “Alien 3” were shown a 2nd time on Sunday's festival program. Thanks to the good organisation of Jakub Klima, Pavel Tomesek and many other people behind the scene, it was a interesting event for the visitors from Germany, France, Nederlands, Switzerland, Italy, Austria and of cause people from the Czech Republic.